Sahi can run multiple scripts simultaneously on multiple instances of browsers. In order to do this, Sahi tracks sessions across domains by setting cookies in a common domain. The default domain is sahi.example.com. This is a dummy domain which is understood only by the Sahi proxy. Sometimes, for adhering to security policies of an organization, one may need to change this domain to an internal one like 192.168.1.1. Open userdata.properties file by either clicking on Sahi Dashboard -> Configure -> userdata.properties, or by opening sahi/userdata/config/userdata.properties in a text editor. Sahi comes with its own SSL root certificate, with which all other website certificates are signed. 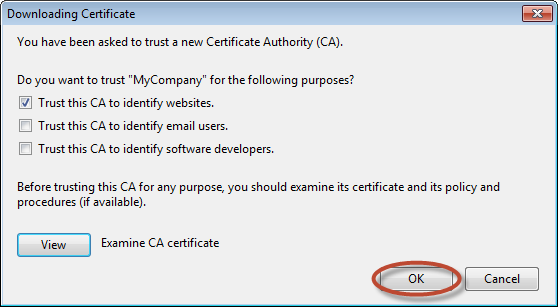 When the browser sees these certificates, it accepts them because we have already accepted the root certificate once. This may be a security risk in rare cases of DNS poisoning or if the machine has been hijacked. One way to preempt this is to create your own local root certificate and provide it to Sahi. Open a command prompt, cd to sahi_pro/certgen and run create_root.bat. It will ask for a few prompts, you can either just press enter and accept the defaults or change the parameters. info Accepting defaults will make it easier to deploy the solution on other machines. Delete sahi_pro/userdata/certgen folder. On the next start of Sahi, this folder will be recreated. -dname "CN=$DOMAIN_NAME, OU=Sahi, O=Sahi, L=Bangalore, S=Karnataka, C=IN"
in sahi_pro/certgen/create_certificate.bat and sahi_pro/certgen/create_certificate.sh and modify it accordingly. -dname "CN=$DOMAIN_NAME, OU=Marketing, O=MyCompany, L=Atlanta, S=Georgia, C=US"
Restart Sahi. The sahi_pro/userdata/certgen will be recreated. Now Sahi is ready with the new root certificate. Once created, the root certificate needs to be accepted on different browsers. The procedure is the same as specified in Configure SSL. However, firefox needs to be configured additionally. 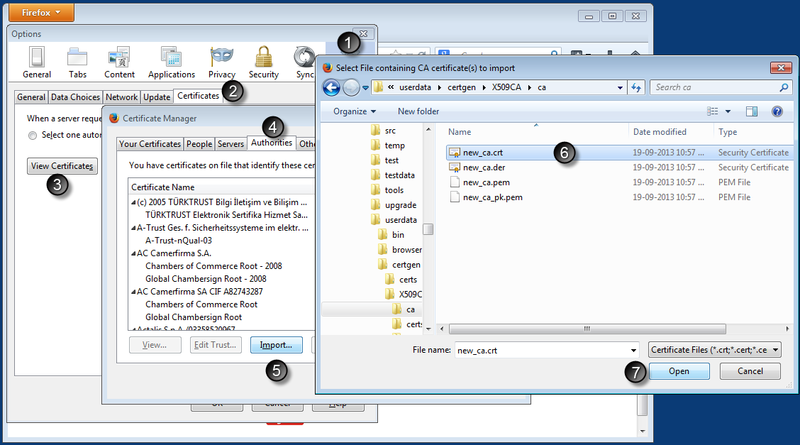 Import the newly created root certificate into firefox. Now this particular Firefox profile has the root certificate installed. To make this certificate work for all profiles, we need to copy the relevant modified files into the template profile. Restart Sahi. Firefox profiles will be recreated. Now Firefox is ready with the new root certificate. Restart Sahi Pro. 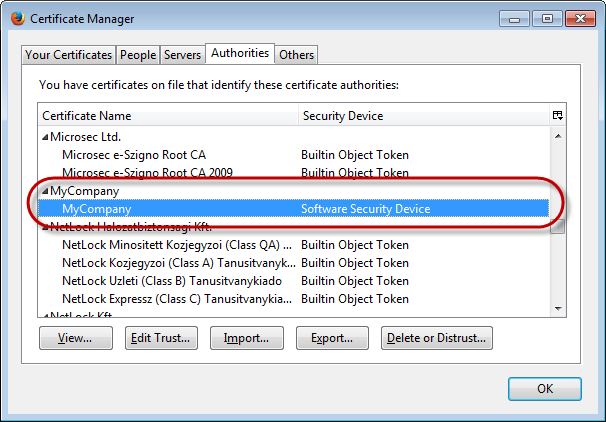 The Sahi Pro installation should now be using the custom root certificate.